Number one, we were late for our private tour as we were driving in from another city and didn't know we couldn't park in the city center. We did finally find parking for 20 but if we had left our car where it was originally parked we would have been towed. Number two, the place we were supposed to meet our guide in the Piazza Maggiore- The Neptune Fountain- was under scaffolding so we couldn't find it. I'm not sure how someone who wasn't familiar with Bologna and that is why we were taking a tour could find it. At any rate, our tour guide Camilla met us and took us on our private walking tour of Bologna. She was very nice and accomodating. Our first stop was a chocolate store with a tasting. We then went to the Market and ended in a restaurant with a glass of local sparkling wine and a meat and cheese plate at 1 p.m. My husband and I both felt there should have been more tastings and more information, given the price of the tour. Another tour was 8 hours and covered Bologna, Parma and Modena for the same price. Personally, I think the tour should have started at the market where she could have pointed out different fish, vegetables, fruits, particularly local ones that we don't have in the USA. I think, given the proximity to Modena, there should have been a balsamic vinegar tasting. Also, the dish she mentioned as local, mortadella stuffed pasta, should have been a tasting. It even says pasta in the description, but there was no tasting. I think it would have been nice to do a small wine tasting maybe 3 of wines before lunch and then, for lunch, we wouldn't have needed as much meat/cheese although it was very good. Lastly, the chocolate tasting should have been last- it is hard to eat 4 pieces of chocolate at 10 am. Camilla was an amazing tour guide. She was very helpful and knowledgeable. She took the time to answer all of our questions and really made our first day in Bologna very special! She even recommended a nice restaurant for us to try and we did! Irt was spectacular! I would definitely recommend! 6 stars should be possible! A wonderful insight into the food history of the city. Our guide showed us through the markets, explained why each selection was important, then took us to the only authentic osteria to sit and eat our collection. Everything included so no hassles. A great tour. Highly recommend. Luca our tour guide was fantastic and shared his wonderful personal and widespread knowledge of both the areas history and food history which was very interesting. My only regret was we didnot do it first day in Bologna because once we had done it we knew where all the best food was. Thank you Luca it was great. We were met by Catia, a knowledgeable and friendly guide. Such delicious tastes and smells - highlights were the chocolate shop and the meat and cheese and wine snack at Tamburini. We still remember this tour and recall it fondly. I am so glad we did it. The tour was fantastic and we learned so much about the history of Bologna. Of course, the highlight was the food tasting at the end. Delicious! Bologna's history is not as self-evident as in some other tourist-destination cities in Italy, so having a good guide is especially important here. Gioco did a great job. Personable and considerate as well as deeply well-informed, he gave us a solid historical tour at the same time as we got to sample some wonderful food. 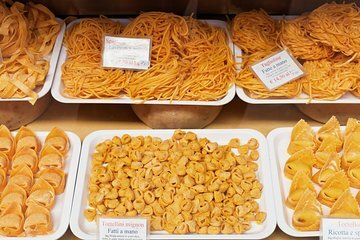 A superb overall guide to the history and of course the food of Bologna. Giacomo, our guide was extremely knowledgable and interesting, and even going to places we had been on our own the day before we learnt so much more. There was probably less about food than we were expecting, but that was fine, and tasting of gelato, chocolate and a superb antipasto lunch with wine rounded it off perfectly, recommended!